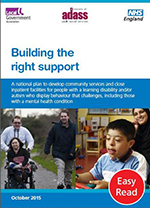 Building the right support – this easy read guide is about a national plan for making health and care services better for people with learning disabilities or on the autism spectrum. 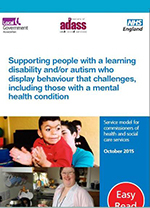 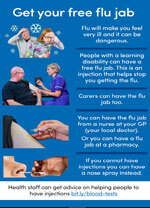 Service model for commissioners of health and social care services – this easy read leaflet describes what good services should look like for people with a learning disability, autism or both. 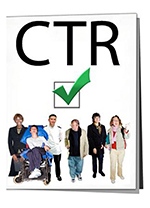 Care and Treatment Review: policy and guidance – this easy read policy document has information on how to do Care and Treatment Reviews and to tell people who pay for your hospital care, how and when to do Care and Treatment Reviews. 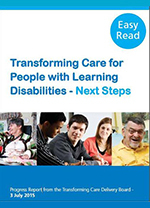 Transforming care – next steps – this easy read plan sets out how national organisations are working together to improve services for people with learning disabilities or on the autism spectrum and who is responsible for what. 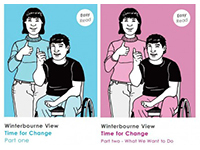 Winterbourne View – Time for Change – Simon Stevens, the Chief Executive of NHS England, asked Sir Stephen Bubb to make this easy read plan, to make sure people with learning disabilities or on the autism spectrum are moved out of specialist hospitals. 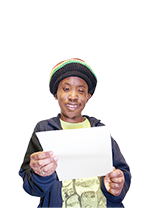 Joint Health and Social Care Learning Disability Self-Assessment Framework 2015 – this easy read letter says how councils and people who pay for health services will check how services for people with a learning disability are working together.